Big meetings are often faced with a big problem – lots of people packed into a conference room or auditorium with their attention easily distracted from the presentation they’re attending. One of the most effective way to keep groups large and small focused on important presentations is through audience response technology. But if all you know of audience response is dedicated “clickers” that register an attendee’s response, then you need an update on everything new audience response systems can do. While the reliable stand-alone clicker is still very much a part of audience response systems, the growth of mobile devices over the last decade has prompted a significant shift in the industry. 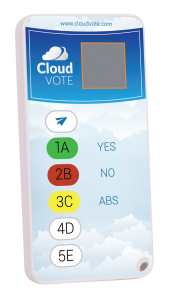 Today, with easy-to-use web-based polling applications such as CloudVOTE, instructors can get all the benefits of traditional clicker-base systems with the benefit of a wide variety of added features. It only takes a few simple steps to set up a presentation in CloudVOTE. First, you upload you existing PowerPoint presentation to our cloud server, after which you’ll be assigned a Session Access Key to share with meeting participants in customizable invitations. Then, through the CloudVOTE website on their laptops or mobile devices (no app download is required), meeting attendees simply enter the key and are taken directly to your presentation. Just like that, the entire presentation becomes interactive, providing your audience with the ability to respond to questions, polls and quizzes, with the results displayed in real time as a part of the presentation. In addition, participants’ replies, questions and poll or quiz results are stored on our secure server for the presenter to use in scoring attendees’ performance or customizing the course for later, all with no extra equipment or set up required. Bred on technology, trying every new gadget there is and a strong believer in tech promoting good in the world. I do what I can to help others learn and teach better, drawing from their success and happiness. We use group participation technology (audience response) to help companies improve employee training & education, speed up decision making, and engage audiences online and offline.